The perfect Pianist Joanne Polk is renowned for her recordings and performances of exceptional repertoire by such female composers as Amy Beach, Judith Lang Zaimont, Clara Wieck Schumann, and Fanny Mendelssohn. 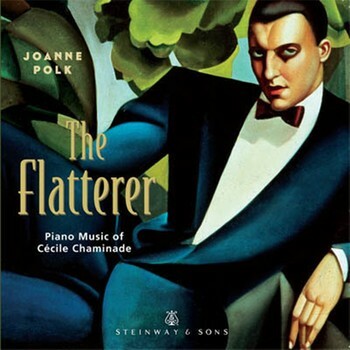 With the release of The Flatterer: Piano Music of Cécile Chaminade (Steinway & Sons, 30037), Joanne Polk continues her exploration of great piano works composed by females. Her program consists of 14 character pieces – sonata, concert études, salon music – written by Cécile Chaminade, the great French Romantic, during the 18th century. Cécile Chaminade’s Piano Sonata, Op. 21 established her reputation as a young composer. Joanne Polk performs its three movements with the erudite sensitivity, technical glitz, and virtuosity she has become known for throughout North America, Europe and Australia. La Lisonjera (“The Flatterer”), Op.50 , Les Sylvains (“The Fauns”), and Autrefois (“Bygone Days”) are all short, lyrical, picturesque pieces that recall Mendelssohn’s Songs Without Words, or in the case of Autrefois(“Bygone Days”), the transparent textures and delicate ornamentation of Ravel or Satie. All three salon pieces capture a refreshingly Classical elegance and charm that distinguishes so much French music of the late 19th century. Polk’s interpretations of these three works are splendid reminders of the compositional integrity of Cécile Chaminade as well as Polk’s amazing keyboard technique. The five concert études performed here are true virtuosic works that go beyond the mere exercise of specific aspects of finger technique. Joanne Polk captures the leggiero perpetual motion, delicate pianistic filigree, and melodic spontaneity of these beautiful woks. Four additional “characteristic” etudes feature Polk’s noteworthy technique that pairs simultaneous accompaniment and melody in one hand; significant use of hand crossing, complex cross rhythms that contrast patterns. Overall, Joanne Polk captures the technical splendor and passion of Cécile Chaminade’s music as well as Steinway piano’s incomparable sound with absolute brilliance. Coming of age in Paris in the second half of the19th century, Cécile Chaminade’s major models were Berlioz, Meyerbeer, Gounod, Bizet, and Franck—all renowned composers of serious Romantic music. When she reached her own compositional maturity in the 1880s, she made her first mark writing in genres associated with these recognized masters. Yet her true voice emerged later, writing smaller character pieces for piano. Her so-called “salon” pieces are the same kind of short works that Brahms and Chopin made popular — many are true virtuoso works, equal in technical difficulty to any of the concert etudes of Chopin or Liszt. Based on this small collection of Chaminade’s music, we can only wonder why she has had to wait so long to be admitted to the pantheon of great French Romantic composers. Everyone needs at least one disc of Chaminade’s piano music, and this disc would make an excellent choice. Yes, she composed a great deal of “salon” music, but what matters is that she did it very well. These pieces are consistently attractive, and they never try to be more than what they are. Sample the Étude romantique, a piece full of virtuosity sentiment–and it’s not a minute too long. Clearly, Chaminade was more than just “a woman composer.” She needs no special pleading. Joanne Polk plays all of these pieces with the necessary virtuosity, lightness and élan. There are some more imposing works here too. It’s not all fluff. The Piano Sonata in C Minor, in three movements, manages to project a sense of seriousness without turning pretentious, while the beefy Étude symphonique and the four Études de concert, Op. 35 achieve a genuinely cumulative impact. Credit Polk also for an especially well-chosen program, with lighter character pieces enfolding the series of etudes and the Sonata–a nice patter of tension and release. As usual with this series, the piano is extremely well recorded, with plenty of presence but no harshness. The instrument’s upper register is particularly well caught. A very enjoyable release. Joanne Polk received her Bachelor of Music and Master of Music degrees from the Juilliard School and her Doctor of Musical Arts degree from Manhattan School of Music. In August 2012, Polk was one of four directors who launched Manhattan in the Mountains, a two-week summer music festival in the Catskill Mountains, devoted to chamber music, solo performing, and community engagement. Joanne Polk has been a member of the Manhattan School of Music piano faculty since 2010 and of the Precollege faculty since 2006 and is an exclusive Steinway artist.